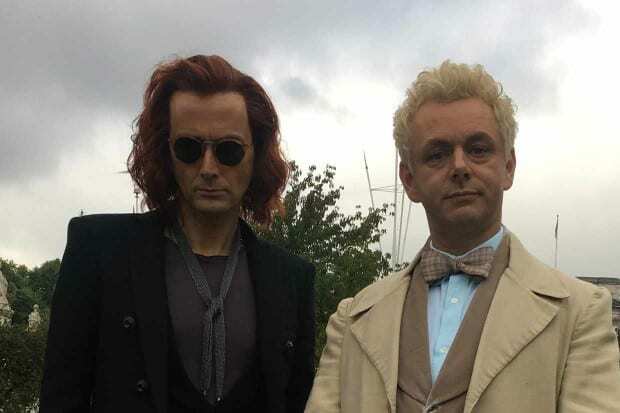 Amazon Studios released the first teaser trailer for the highly-anticipated series adaptation of Good Omens today during the panel at New York Comic-Con. alongside poster art and never seen before images. The panel, at the Hulu Theater at Madison Square Garden, was moderated by Whoopi Goldberg and featured creator & showrunner Neil Gaiman, director Douglas Mackinnon, along with series stars David Tennant, Michael Sheen, Jon Hamm, and Miranda Richardson. During the panel about the experience of bringing the much-loved novel to the screen. Fans at the panel were given a first sneak-peek of series which is a dark, comedic story set in modern day Britain that centers on the stoic and sensible angel, Aziraphale (played by Sheen) and the suave man-about-town demon, Crowley (played by Tennant) as they join forces to prevent the coming of the Apocalypse. The series will premiere in 2019 exclusively on Amazon Prime Video.